SCARF PEP! Leader Chastity Crowder, center, of Lockington, hands out suckers to Chasmine Shawler, left, 8, of Sidney, daughter of Jasmine Shawler and David Livermore, and Jordan Wade, 8, of Houston, son of Samantha Griffin and Brandon Griffin and Jordy Wade. The kids were supposed to give away three of the suckers and tell the people they gave them to what they had learned from Crowder about how to take care of a pet. HOUSTON — In addition to raising funds to support animal care at the Shelby County Animal Shelter, the Shelby County Animal Rescue Foundation (SCARF) is on a mission to educate people about responsible pet ownership. One of the ways it plans to do that is through its association with the Pet Education Project (PEP), a Shreveport, Louisiana-based organization that hopes to turn kids into animal heroes. Chastity Crowder, of Lockington, is a SCARF board member and the local PEP coordinator. Recently, she, along with SCARF’s mascot, Scarfie, and volunteer Becky Kubichek, led SCARF’s first PEP presentation, Monday, March 25. Children in kindergarten through fourth grades at Hardin-Houston Elementary School who particpate in the school’s FFA Earth Lab after-school project, learned the five steps to becoming animal heroes: food, water, shelter, care and love. “How can you show your pet love?” Crowder, dressed in the bright green superhero’s cape and crown of an animal hero, asked. “Brush them.” “Cuddle with them.” “Take them to their favorite places.” “Pet them.” “Play with them.” The answers came thick and fast. The PEP outreach will visit with a Girl Scout troop soon and is available to other schools and organizations. In addition to the 20- to 30-minute presentation by Crowder, the program can include a coloring contest, as it did in Houston, and handouts. At the school, Crowder distributed packages of suckers to the children. In each package, three of the suckers had SCARF and PEP labels and three did not. Plans call for PEP to present information when groups tour the new Bob Sargeant and Family Shelby County Animal Shelter, now under construction in Sidney, and at SCARF events like Cans for Canine drives. “We’re writing grants to support PEP,” Crowder said. “Money donated to SCARF is for caring for pets. We won’t take away from that.” A Shelby County Community Foundation grant covered the costs of the PEP presentation visual aids. Children at the Earth Lab session enjoyed making dog treats for pets at the animal shelter to round out the meeting. And they were excited about what they were learning. “You can take them to the vet even when they’re not sick,” said Clara Kelly, 6, daughter of Jennifer and Scott Kelly, when asked what the talk had taught her. The kindergarten student has two cats, Paul and Lou. Dog-owner Hunter Calloway, 7, a second-grader, the son of Mandi and Travis Calloway, and winner of the coloring contest, said he pretty much knew everything that was presented before he came to the program. His family has “three pets — no, four — three labs and a cat.” Since he heard the PEP talk, “I’ll make sure (my oldest dog) is healthy,” he said. 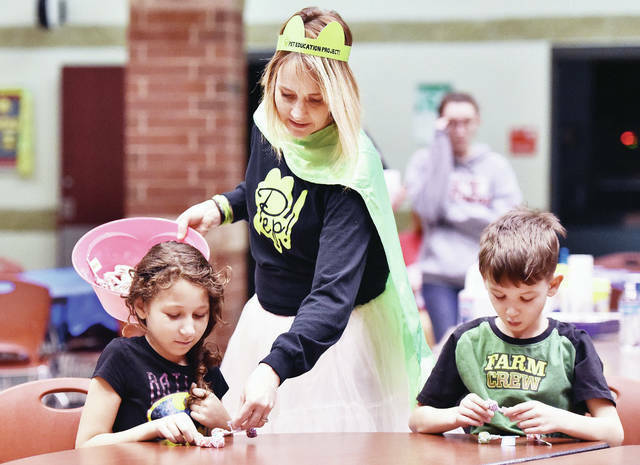 Making the treats was the favorite part of the afternoon for Zander DeLong, 7, son of Adela and Jonathan Delong and in the first grade. He thought the presentation was “really good.” He has a turtle named Briann. “You need to take care of your pet,” she said. She planned to give her labeled suckers to her mother, grandmother and brother. Crowder is glad the program is working. “SCARF has believed for a long time that we need to get on the front end to educate kids. It’s important to let these kids know, hopefully to break the next generation from neglect,” she said. The PEP program can be adapted for presentation to children in kindergarten through junior high. For information or to schedule a presentation, visit www.helpshelbycountyanimals.com.